What is a dance out? OGQ does community service type dance outs and paid dance outs! If OGQ receives a donation for our services…it goes back to the dancers…one way or another! Monies help with operational needs, travel funds, special seminars, recital dance out attire/props and incentives/prizes. Some shows are all demonstration – while others are part demo and part audience participation. FYI- 90% of the shows that are on our list are usually requested by someone involved in OGQ. How do I sign up for a dance-out? You should be automatically “invited” to shows via the sign up genius program. Some shows are open to all levels – others are not! Shows do fill up fast! You will need to sign up according to your level. If there are no longer spots available for your level…and you really want to do something – your Grandma lives there etc…send an email to ogqteachers@gmail.com. Please do not hit reply to sender with the sign up genius…since that is not an active email account – just a “dummy” account to facilitate the sign ups. See the tab…Find a sign up….click on it. It asks for the creators email. Type in ogqadmin@gmail.com and all the sign ups are there…. New to the School and you have questions about parades or dance outs? Send an email to ogqteachers@gmail.com and we will be happy to answer any questions! Another option is to use our parent form. This is a great resource for parents to ask other parents questions! I am a beginner or an advanced beginner – What do I wear for a dance out? Option #1 – OGQ parade shirt, black/red skirt/skort and poodle socks for girls and black pants and the black OGQ shirt or boys. I am novice thru open – what do I wear for a dance out? Option# 2 – black or red skirt/skort…OGQ parade shirt or black sequin tank depending on what is requested for the show on sign up genius. It may be wigs or not. If you are a junior-sized dancer…please make sure you have either a black or red forever 21 skirt. There are black forever 21 skirts for sale in the school store. We also have a few black sequin tanks available for sale. What do I wear for a parade? Black pants (yoga/exercise pants fine- no leggings) and black OGQ parade shirt. Weather will determine what else is worn. Turtlenecks.…coats etc. We have marched in snow and we have marched in 70 degree heat. Watch for emails when it gets closer to the day. If a parent wishes to march with OGQ– a parade shirt and black pants are also needed. Parade shirts are always available. FYI- We are judged…in the parades…..one thing is uniformity. That is why we ask the parents to wear the same as the kids. 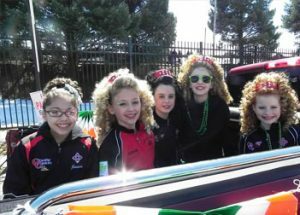 OGQ usually participates in 3 parades – Bethlehem, Clinton, NJ and Allentown – please join us if you can! Are dance-outs open to the public? It all depends…read the sign up genius carefully. If the dance out is closed to parent observation – then it will be clearly stated. Most shows are open to the parents – some are better than the others! Most assisted living facilitates – just hang out in the back or on the side. Let us know if you have a connection to any of the sign ups listed. Let’s say OGQ is dancing at your dancers school or parish! We want to know! Let’s say your grandma is at the Traditions of Hanover – we want to know. This week we will be posting on the VOY forum…asking about connections. What is the benefit of my dancer participating in a dance out? OGQ believes that a dance out or performance is a valuable tool through which students strengthen their dance and teamwork skills, connect with the community in a meaningful way by sharing their talents with others. Many dancers look great at class and then when they get to the competition environment they don’t perform at the best of their ability! Dance outs give students numerous opportunities to “practice” their performance skills at very “loving” crowd-pleasing venues! Dance outs as well as feisanna ( competitions) are optional – but we highly suggest dancers give it a try! Most of the time we think a lot of the dance outs as a CLASS in an ALTERNATE LOCATION! Students are learning how to perform….confidently. We also find that dancers come back to class after the shows – so motivated to learn the next higher level dances! We try to concentrate our shows into these areas for purpose of attracting new students or to share our talents to benefit the communities in which we have classes.